When I saw the trailers for Fantastic Mr. Fox, I was somewhat under whelmed; the two-legged animal protagonists looked primitive to me compared to the nearly seamless, if equally-stylized look of Coraline -- the most recent stop-motion movie to which I could compare it. I heard it got extremely good reviews, but I wasn't able to see it in the theater. Today, I have had the chance to review the Blu-Ray release of it, and it also includes DVD and Digital Copy; and I am glad that I did. The movie is a mix of Wes Anderson's imagination and a Roald Dahl book that I haven't read, but apparently only loosely follows the movie. The movie stars George Clooney as the voice of the titular Mr. Fox, a wily chicken-thieving rascal in his younger days who now lives a more domestic life with his wife Felicity (Meryl Streep) and their child Ash (Jason Schwartzman). The movie gets going when Mr. Fox breaks his long-standing vow of getting out of the life and goes back to stealing from three of the meanest human farmers around: Boggis, Bunce, and Bean. The stop-motion look of the film is highly unique. It reminded me of what might have been a lushly made 70's children's TV show; but when you look at the detail, the production values are far too high for that. The movie makes the most of its voice-casting with Clooney giving a performance that is as polished as it is memorable. Clooney plays a smooth, lovable rogue with more than a little sophistication better than anyone else I can think of. He projects familial warmth with his wife, and when the time comes, love for his son with a sense that carries through the puppets. The dialog of the movie is talky and deadpan, and it works in ways that have to be seen to be believed. Blu Ray is especially kind to this movie as the colors and sets are not just vivid, but even move into the "eye-popping" category. Where the movie needs punch, it doesn't fail -- think Willem Dafoe as a criminal rat. It evokes the peculiar and somewhat dark humor of Dahl in unexpectedly brilliant ways. The ending of the book didn't suit the movie, and when the production team cast about for another one, they found sketches and notes for an original and unpublished ending that suited them perfectly. This results in what I would call an "instant classic", but honestly, that is what it should be. The physical product is three discs: the Blu-Ray, a DVD (great to give to the kids so they don't damage your Blu-ray! ), and a Digital copy that you can use on your computer, iPad, or whatever. There are several extras: several "making of" pieces and notes from Anderson that are worth looking at. The short pieces on the fictional game of 'Whack-Bat' and Dahl are not especially value added. However, on the other hand, the reason to own this is because it will look great on Blu-Ray; and it does. The production is stylish, sophisticated, and brilliant. It is a movie worth seeing, and if you see it at home, this is how you should view it. Download Fantastic Mr. Fox from the iTunes Store in Digial HD. 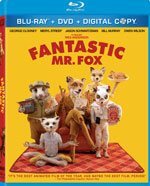 For more information about Fantastic Mr. Fox visit the FlickDirect Movie Database.